Here's the solution to all your converting, copying, converting and transferring problems on iPod, even iPhone! 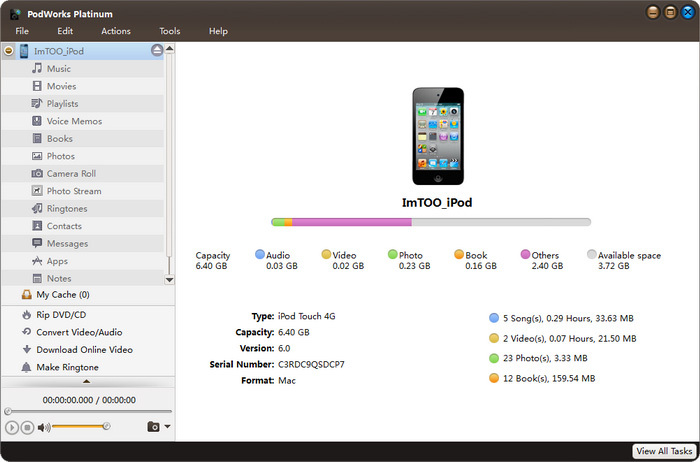 ImTOO PodWorks Platinum is the ultimate iTunes-alternative and upgrade - which can convert DVD, video, and audio files such as AVI, MPEG, WMV, WMA, etc. to iPod files and transfer them to iPod, backup iPod files to computer, download online videos from top online sites, create photo albums/iPhone ringtones, manage several devices at the same time and much more! iTunes library is empty? 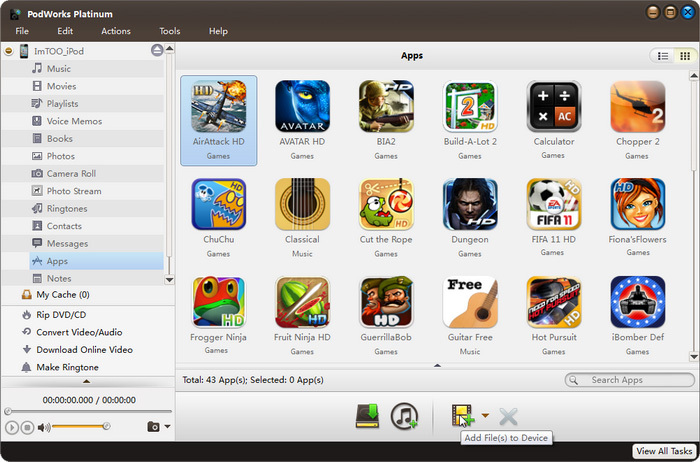 Build your iTunes library from iPod; synchronize iTunes with your iPod. 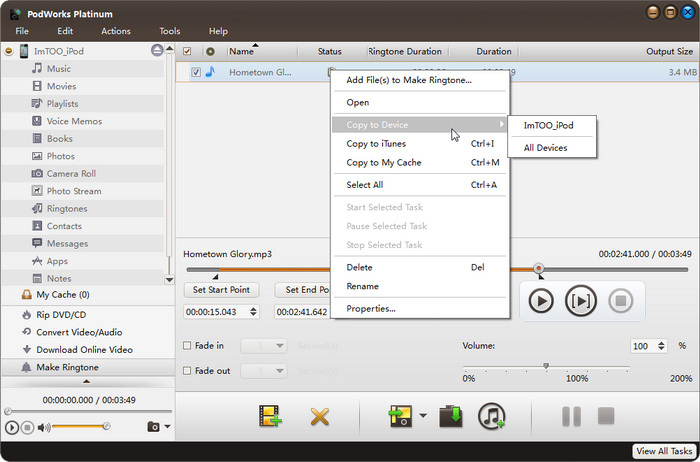 Using ImTOO PodWorks Platinum, you can simply copy iPod songs, movies, videos to computer and to your iTunes library. Don't let iTunes limit your options, do more with ImTOO PodWorks Platinum! 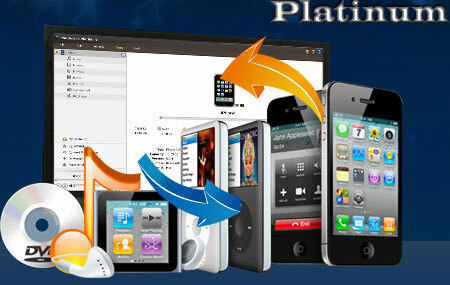 Transfer songs, videos, photos, playlists, SMS, contacts and eBooks from iPod to PC/iTunes quickly and efficiently. Convert all contents in DVD/CD discs and convert to iPod compatible files, transfer to the devices immediately after the conversion. 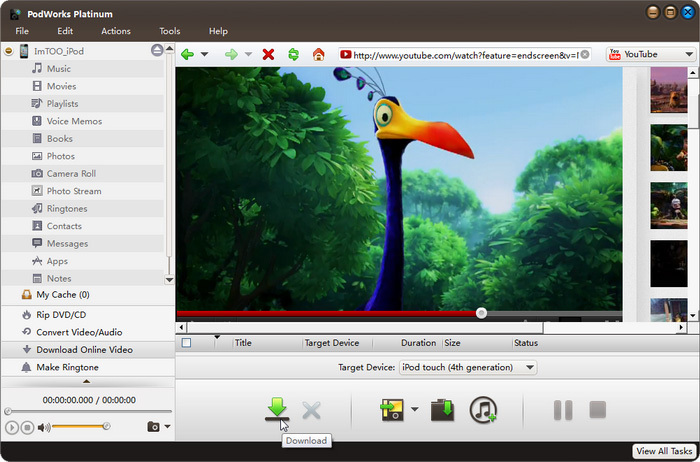 Enable you to surf on the most popular online video websites (YouTube, Metacafe, Dailymotion, Break, Vimeo, Revver, Blip, Vidilife and Stickam) within the application, download online and convert to the formats compatible with iPod and transfer to the devices instantly. Provide optimized profiles to convert DVDs/videos/audios to iPod/iPhone files. Automatically select a compatible profile for the imported file. 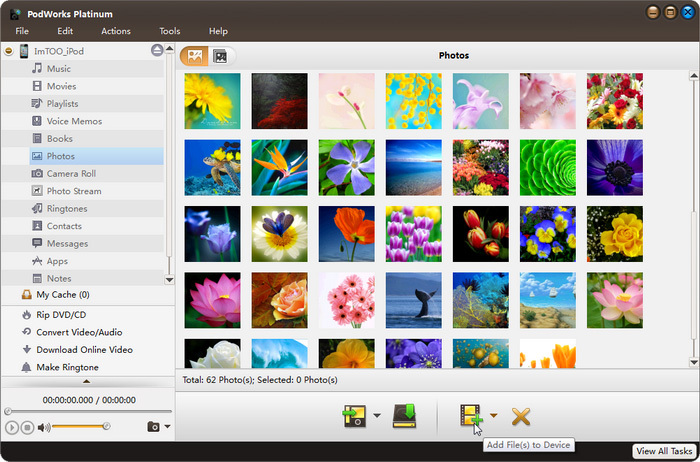 Convenient and effective to add files into the application, import one by one or the whole folder directly. 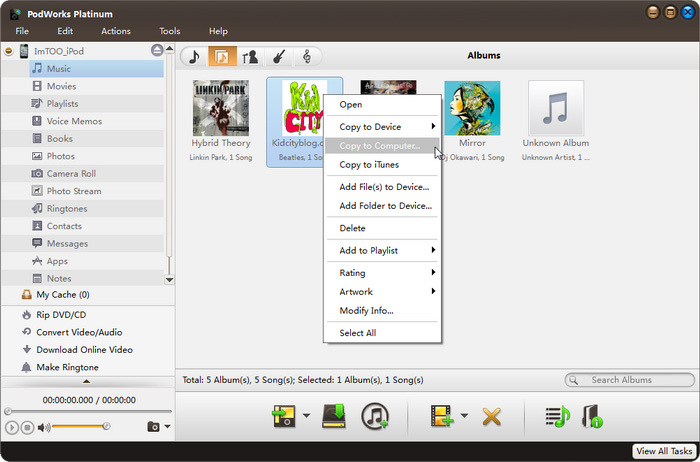 Create & copy new playlists and photo albums to iTunes freely. 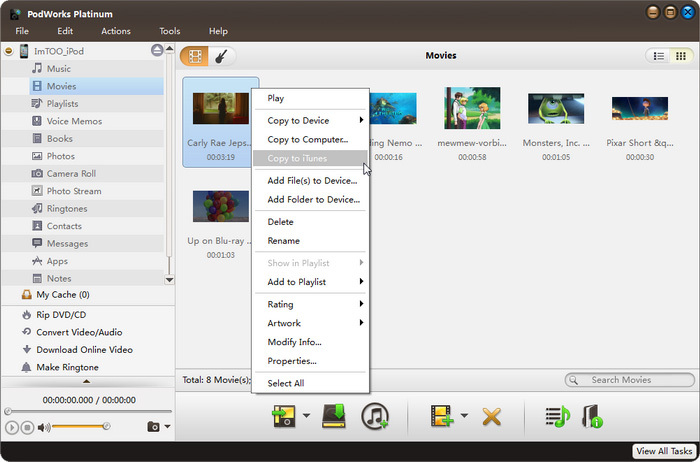 Come with a built-in resizable media player to preview your iPod/iPhone videos/music and DVD movies directly.. Install ImTOO PodWorks Platinum on your iPod and easily use it anywhere. Transfer, backup and manage iPod Music, Movies, eBooks, SMS, contacts and iPhone Ringtones. 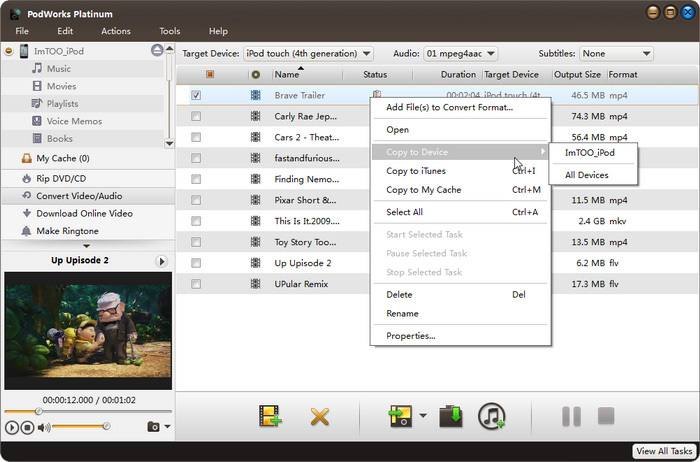 Convert home DVD/CD discs to iPod compatible video/audio formats and transfer directly to iPod or iTunes. 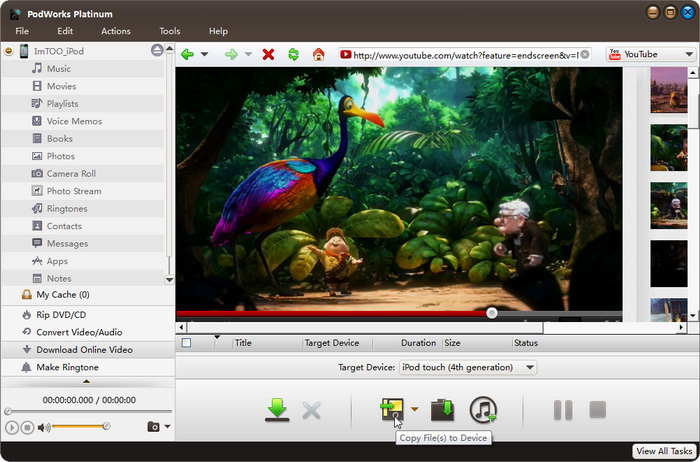 Convert video and audio in any format and transfer to iPod. Download online videos for iPod from the top rated online video websites like YouTube. Create personalised iPhone ringtones from audios and videos and transfer to iPhone or iTunes. Fully support all iPod/iPhone, latest iPhone XS, iPhone XS Max, iPhone XR, iOS 12 and iTunes 12.